At 1,776 feet tall – a height designed to pay homage to the signing of the Declaration of Independence – New York City’s One World Trade Center is the tallest building in the Western Hemisphere. Featuring an iconic design comprised of eight elongated isosceles triangles, the 104-story office tower built adjacent to the 9/11 Memorial & Museum is topped by the One World Observatory and a 408-foot tall spire. Architect David Childs, of Skidmore, Owings, and Merrill, LLP (SOM), in New York, designed the office tower – which opened in 2014 – to recapture the New York skyline, reassert Manhattan’s preeminence as a business center and establish a new civic icon for the country, according to SOM, which states that One World Trade Center replaces nearly one-quarter of the office space lost on Sept. 11, 2001. 3A Composites USA chose to recreate the One World Trade Center tower in a 200th scale model for display at last fall’s Specialty Printing & Imaging Technology’s SGIA Expo 2016, which opened in Las Vegas, Nev., just days following the 15th anniversary of the 9/11 terrorist attacks. Charlotte-based Classic Graphics, a wholly owned subsidiary of Imagine! Print Solutions, was enlisted to design and fabricate the 54-inch tall model, which includes a 9-inch spire. 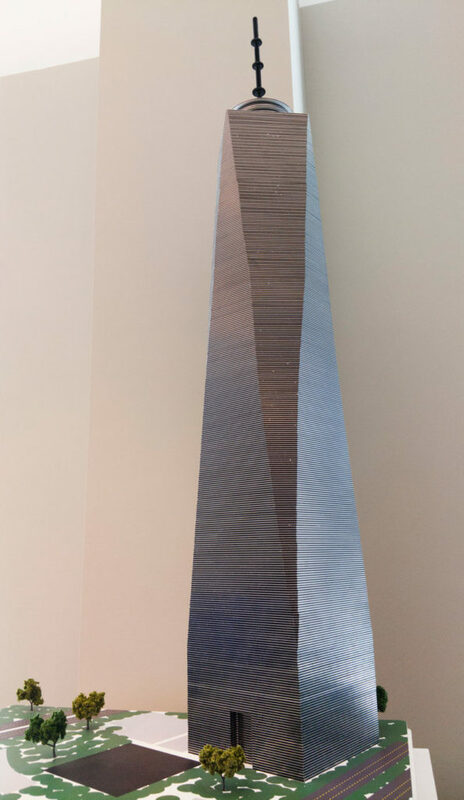 To do justice to this iconic design, 3mm Dibond® Brushed Silver aluminum composite material (ACM) by 3A Composites USA fittingly was chosen to recreate the light-reflective look of One World Trade Center. The model’s base features the tower’s landscape design digitally direct printed on new 12mm Banova® Print, which recently was introduced as part of 3A Composites’ PRO Series – the next generation of graphic display boards featuring enhanced printing surfaces. Banova Print combines the lightweight, rigid and renewable properties of Banova – a balsa wood sheet made of adhesively bonded balsa veneers – with laminated bright white PRO Series facers designed with enhanced printing surfaces. 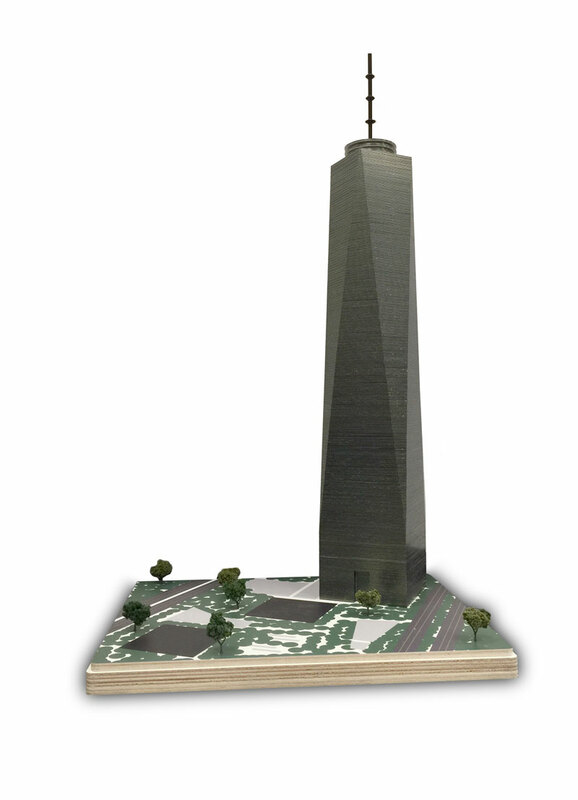 The Classic Graphics’ design team researched images and building specs for One World Trade Center before creating the model design with CAD software, according to Dan House, creative manager, Classic Graphics. 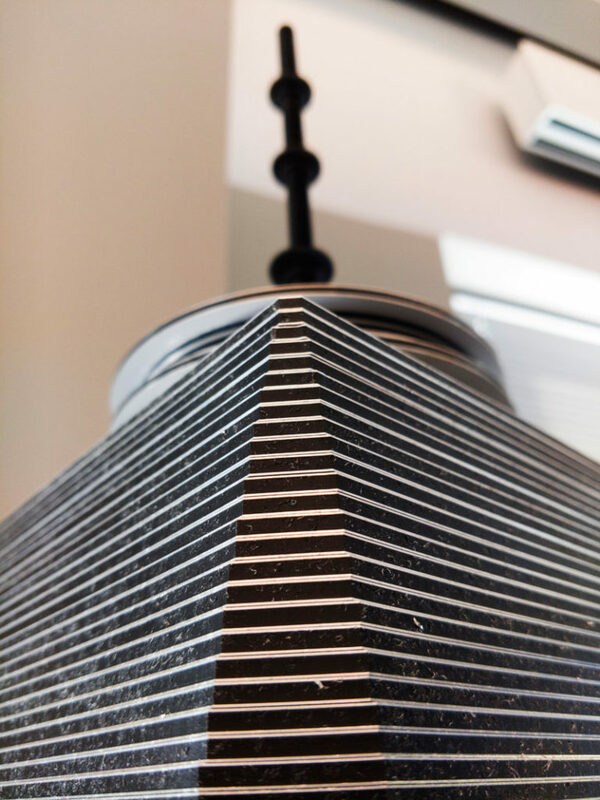 At its base, the tower model measures 8-by-8 inches and tapers to 5 5/8-by-5 5/8 inches at its top. The model’s representation of the One World Observatory was built with 11 circular rings – including six 5-inch diameter rings and five 4.5-inch diameter spacer rings – routed from Dibond Brushed Silver, which were adhered with permanent adhesive tape and installed over the corrugated tube. The tower’s 9-inch spire was built with a threaded metal rod, which was painted black and installed on top of the model’s observatory. The model’s landscape-printed base was fabricated with a total of four pieces of 12mm Banova Print – three panels measuring 30 inches by 24 inches and the top panel measuring 29.5 inches by 23.5 inches – which were adhered together with permanent adhesive tape. The landscape design was printed on the top Banova Print layer featuring bright white PRO Series facers with a Durst Rho 1000 UV-flatbed printer. The model’s printed landscape base was finished with miniature artificial shrubbery; and, the tower was screwed to the base. A special table and crate were built by ACI Design, of Indian Trail, N.C., for display and transportation of the One World Center model, which weighs approximately 90 pounds. From design through fabrication, the project was completed in approximately three weeks, according to Kim Kiker, account sales representative, Classic Graphics. 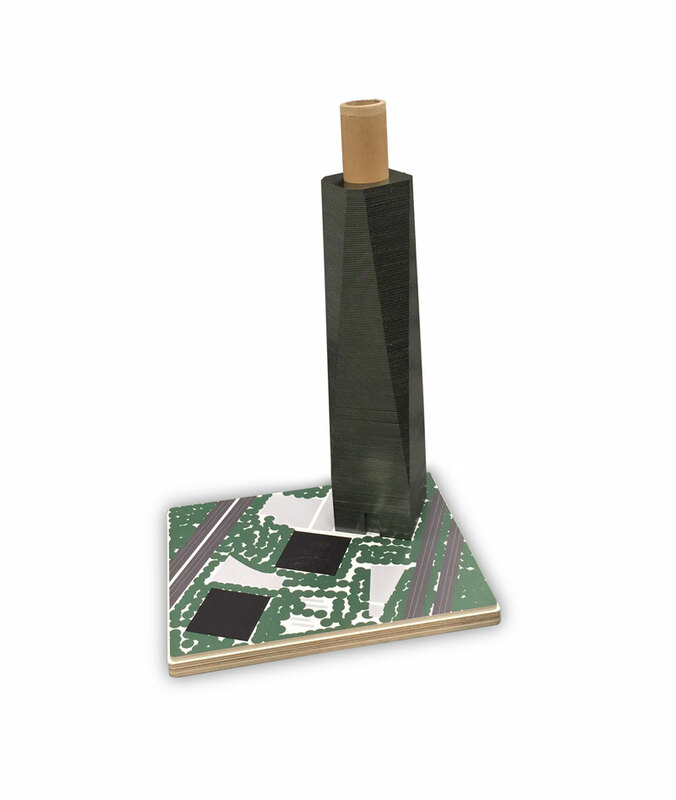 The One World Trade Center model currently is displayed in the 3A Composites USA headquarters in Davidson, N.C., and is a popular graphic display with customers visiting the office, according to Branham.